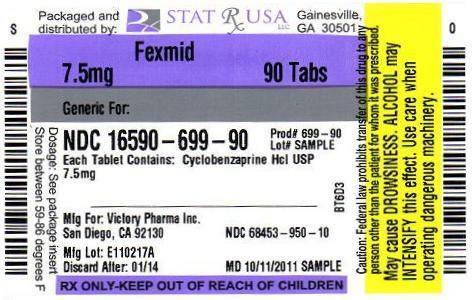 Fexmid is available for oral administration as 7.5 mg tablets. Fexmid contains the following inactive ingredients: colloidal silicon dioxide, croscarmellose sodium, dibasic calcium phosphate, hydroxypropyl cellulose, hypromellose, polyethylene glycol, magnesium stearate, microcrystalline cellulose, and titanium dioxide. Fexmid relieves skeletal muscle spasm of local origin without interfering with muscle function. It is ineffective in muscle spasm due to central nervous system disease. In a pharmacokinetic study in elderly individuals (â‰¥65yrs old), mean (n=10) steady-state cyclobenzaprine AUC values were approximately 1.7 fold (171.0 ng.hr/mL, range 96.1 to 255.3) higher than those seen in a group of eighteen younger adults (101.4 ng.hr/mL, range 36.1 to 182.9) from another study. Elderly male subjects had the highest observed mean increase, approximately 2.4 fold (198.3 ng.hr/mL range 155.6 to 255.3 versus 83.2 ng.hr/mL, range 41.1 to 142.5 for younger males) while levels in elderly females were increased to a much lesser extent, approximately 1.2 fold (143.8 ng.hr/mL, range 96.1 to 196.3 versus 115.9 ng.hr/mL, range 36.1 to 182.9 for younger females). In light of these findings, therapy with cyclobenzaprine HCI in the elderly should be initiated with a 5 mg dose and titrated slowly upward. In a pharmacokinetic study of sixteen subjects with hepatic impairment (15 mild, 1 moderate per Child-Pugh score), both AUC and Cmax were approximately double the values seen in the healthy control group. Based on the findings, cyclobenzaprine HCI should be used with caution in subjects with mild hepatic impairment starting with the 5 mg dose and titrating slowly upward. Due to the lack of data in subjects with more severe hepatic insufficiency, the use of Fexmid in subjects with moderate to severe impairment is not recommended. No significant effect on plasma levels or bioavailability of cyclobenzaprine HCl or aspirin was noted when single or multiple doses of the two drugs were administered concomitantly. Concomitant administration of cyclobenzaprine HCl and naproxen or diflunisal was well tolerated with no reported unexpected adverse effects. However combination therapy of cyclobenzaprine HCl with naproxen was associated with more side effects than therapy with naproxen alone, primarily in the form of drowsiness. No well-controlled studies have been performed to indicate that cyclobenzaprine HCl enhances the clinical effect of aspirin or other analgesics, or whether analgesics enhance the clinical effect of cyclobenzaprine HCl in acute musculoskeletal conditions. Eight double-blind controlled clinical studies were performed in 642 patients comparing cyclobenzaprine HCl 10 mg, diazepam**, and placebo. Muscle spasm, local pain and tenderness, limitation of motion: and restriction in activities of daily living were evaluated. In three of these studies there was a significantly greater improvement with cyclobenzaprine HCl than with diazepam, while in the other studies the improvement following both treatments was comparable. Although the frequency and severity of adverse reactions observed in patients treated with cyclobenzaprine HCl were comparable to those observed in patients treated with diazepam, dry mouth was observed more frequently in patients treated with cyclobenzaprine HCl and dizziness more frequently in those treated with diazepam. The incidence of drowsiness, the most frequent adverse reaction, was similar with both drugs. The efficacy of cyclobenzaprine HCl 5 mg was demonstrated in two seven-day, double-blind, controlled clinical trials enrolling 1405 patients. One study compared cyclobenzaprine HCl 5 and 10 mg t.i.d. to placebo; and a second study compared cyclobenzaprine HCl 5 and 2.5 mg t.i.d. to placebo. Primary end-points for both trials were determined by patient-generated data and included global impression of change, medication helpfulness, and relief from starting backache. Each endpoint consisted of a score on a 5-point rating scale (from 0 or worst outcome to 4 or best outcome). Secondary endpoints included a physician's evaluation of the presence and extent of palpable muscle spasm. Comparisons of cyclobenzaprine HCl 5 mg and placebo groups in both trials established the statistically significant superiority of the 5 mg dose for all three primary endpoints at day 8 and, in the study comparing 5 and 10 mg, at day 3 or 4 as well. A similar effect was observed with cyclobenzaprine HCl 10 mg (all endpoints). Physician-assessed secondary endpoints also showed that cyclobenzaprine HCl 5 mg was associated with a greater reduction in palpable muscle spasm than placebo. Analysis of the data from controlled studies shows that cyclobenzaprine HCl produces clinical improvement whether or not sedation occurs. A post-marketing surveillance program was carried out in 7607 patients with acute musculoskeletal disorders, and included 297 patients treated with cyclobenzaprine HCl 10 mg for 30 days or longer. The overall effectiveness of cyclobenzaprine HCI was similar to that observed in the double-blind controlled studies; the overall incidence of adverse effects was less (see ADVERSE REACTIONS). Fexmid is indicated as an adjunct to rest and physical therapy for relief of muscle spasm associated with acute, painful musculoskeletal conditions. Improvement is manifested by relief of muscle spasm and its associated signs and symptoms: namely, pain, tenderness, limitation of motion, and restriction in activities of daily living. Fexmid should be used only for short periods (up to two or three weeks) because adequate evidence of effectiveness for more prolonged use is not available and because muscle spasm associated with acute, painful musculoskeletal conditions is generally of short duration and specific therapy for longer periods is seldom warranted. Fexmid has not been found effective in the treatment of spasticity associated with cerebral or spinal cord disease, or in children with cerebral palsy. Fexmid is closely related to the tricyclic antidepressants, e.g., amitriptyline and imipramine. In short term studies for indications other than muscle spasm associated with acute musculoskeletal conditions, and usually at doses somewhat greater than those recommended for skeletal muscle spasm, some of the more serious central nervous system reactions noted with the tricyclic antidepressants have occurred (see WARNINGS, below, and ADVERSE REACTIONS). Fexmid may enhance the effects of alcohol, barbiturates, and other CNS depressants. Because of its atropine-like action, Fexmid should be used with caution in patients with a history of urinary retention, angle-closure glaucoma, increased intraocular pressure, and in patients taking anticholinergic medication. These patients are generally more susceptible to drugs with potentially sedating effects, including cyclobenzaprine. Cyclobenzaprine HCl should be used with caution in subjects with mild hepatic impairment starting with a 5 mg dose and titrating slowly upward. Due to the lack of data in subjects with more severe hepatic insufficiency, the use of Fexmid in subjects with moderate to severe impairment is not recommended. Fexmid, especially when used with alcohol or other CNS depressants, may impair mental and/or physical abilities required for performance of hazardous tasks, such as operating machinery or driving a motor vehicle. In the elderly, the frequency and severity of adverse events associated with the use of cyclobenzaprine, with or without concomitant medications, is increased. In elderly patients, cyclobenzaprine HCl should be initiated with a 5 mg dose and titrated slowly upward. In rats treated with cyclobenzaprine HCl for up to 67 weeks at doses of approximately 5 to 40 times the maximum recommended human dose, pale, sometimes enlarged, livers were noted and there was a dose-related hepatocyte vacuolation with lipidosis. In the higher dose groups this microscopic change was seen after 26 weeks and even earlier in rats which died prior to 26 weeks; at lower doses, the change was not seen until after 26 weeks. Reproduction studies have been performed in rats, mice and rabbits at doses up to 20 times the human dose, and have revealed no evidence of impaired fertility or harm to the fetus due to cyclobenzaprine HCl. There are, however, no adequate and well-controlled studies in pregnant women. Because animal reproduction studies are not always predictive of human response, this drug should be used during pregnancy only if clearly needed. It is not known whether this drug is excreted in human milk. Because cyclobenzaprine is closely related to the tricyclic antidepressants, some of which are known to be excreted in human milk, caution should be exercised when cyclobenzaprine HCl is administered to a nursing woman. Safety and effectiveness of Fexmid in pediatric patients below 15 years of age have not been established. The plasma concentration of cyclobenzaprine is increased in the elderly (see CLINICAL PHARMACOLOGY, Pharmacokinetics, Elderly). The elderly may also be more at risk for CNS adverse events such as hallucinations and confusion, cardiac events resulting in falls or other sequelae, drug-drug and drug-disease interactions. For these reasons, in the elderly, Fexmid should be used only if clearly needed. In such patients cyclobenzaprine HCl should be initiated with a 5 mg dose and titrated slowly upward. The following list of adverse reactions is based on the experience in 473 patients treated with cyclobenzaprine HCl 10 mg in additional controlled clinical studies, 7607 patients in the post-marketing surveillance program, and reports received since the drug was marketed. The overall incidence of adverse reactions among patients in the surveillance program was less than the incidence in the controlled clinical studies. Cardiovascular:Tachycardia; arrhythmia; vasodilatation; palpitation; hypotension. Hypersensitivity: Anaphylaxis; angioedema; pruritis; facial edema; urticaria; rash. â€¡Note: Cyclobenzaprine HCl Tablets 10 mg data are from one clinical trial. Cyclobenzaprine HCl Tablets 5 mg and placebo data are from two studies. Urogenital: Impaired urination; dilatation of urinary tract; impotence; testicular swelling; gynecomastia: breast enlargement; galactorrhea. Pharmacologic similarities among the tricyclic drugs require that certain withdrawal symptoms be considered when Fexmid is administered, even though they have not been reported to occur with this drug. Abrupt cessation of treatment after prolonged administration rarely may produce nausea, headache, and malaise. These are not indicative of addiction. Although rare, deaths may occur from overdosage with Fexmid. Multiple drug ingestion (including alcohol) is common in deliberate cyclobenzaprine overdose. As management of overdose is complex and changing, it is recommended that the physician contact a poison control center for current information on treatment. Signs and symptoms of toxicity may develop rapidly after Fexmid overdose; therefore, hospital monitoring is required as soon as possible. The acute oral LD50 of cyclobenzaprine HCl is approximately 338 and 425 mg/kg in mice and rats, respectively. The most common effects associated with cyclobenzaprine overdose are drowsiness and tachycardia. Less frequent manifestations include tremor, agitation, coma, ataxia, hypertension, slurred speech: confusion, dizziness, nausea, vomiting, and hallucinations. Rare but potentially critical manifestations of overdose are cardiac arrest, chest pain, cardiac dysrhythmias, severe hypotension, seizures, and neuroleptic malignant syndrome. Changes in the electrocardiogram, particularly in QRS axis or width, are clinically significant indicators of cyclobenzaprine toxicity. All patients suspected of an overdose with Fexmid should receive gastrointestinal decontamination. This should include large volume gastric lavage followed by activated charcoal. If consciousness is impaired, the airway should be secured prior to lavage and emesis is contraindicated. A maximal limb-lead QRS duration of â‰¥0.10 seconds may be the best indication of the severity of the overdose. Serum alkalinization, to a pH of 7.45 to 7.55, using intravenous sodium bicarbonate and hyperventilation (as needed), should be instituted for patients with dysrhythmias and/or QRS widening. A pH > 7.60 or a pCO2 < 20 mmHg is undesirable. Dysrhythmias unresponsive to sodium bicarbonate therapy/hyperventilation may respond to lidocaine, bretylium or phenytoin. Type 1A and 1C antiarrhythmics are generally contraindicated (e.g., quinidine, disopyramide, and procainamide). Fexmid (cyclobenzaprine hydrochloride tablets USR 7.5 mg) are round, white, film-coated tablets imprinted WATSON and 3330 supplied in bottles of 100 (NDC 68453-950-10).